The game got off to a slow start for both teams as neither seem looked comfortable from the jump, which is fair considering the nerves involved with an opening playoff game. Both teams settled down as the first quarter continued as the Nuggets finally started to find their rhythm offensively. 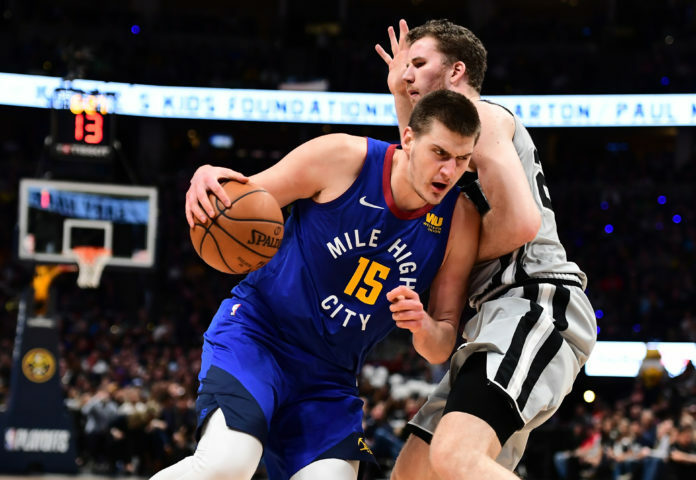 That all started with Nikola Jokic asserting himself on that end of the floor as San Antonio had no recipe of how to slow down the Nuggets big man. Jokic finished the first quarter with four points, five rebounds, and four assists as he was officially on triple-double watch after 12 minutes of play. If it was not for Jokic, the Nuggets might have been in trouble early as they shot just 29 percent from the field in the first quarter and were 1-of-9 from three-point land. Because of that, the Spurs were able to take a 25-20 lead into quarter number two. The Nuggets offense just did not look the same without Jokic though, which is why Michael Malone subbed him back into the game just 3:30 into the second quarter. With Jokic back in, the Spurs still continued to dominate as they built a 10-point lead in large part to opening the period 8-of-8 shooting from the field. San Antonio was hitting almost every shot they took, while Denver was struggling to make any type of bucket. It was not till 6:37 in the second quarter that Denver finally got a break as LaMarcus Aldridge picked up his third foul. That allowed Jokic to match up against San Antonio’s other center — Jakob Poeltl — for the remainder of the half, which favored the Nuggets in a big way. 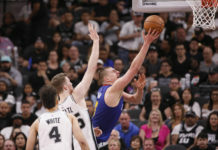 Jokic was constantly looking to get his teammates involved as he had nine first half assists, but the Spurs were still able to take a 59-51 lead into halftime. At the break, Denver was shooting just 42 percent from the field and were 2-of-13 from three-point range, while San Antonio was shooting 54 percent and were 5-of-10 from three. Jokic led the Nuggets offensively with four points, seven rebounds, and nine assists, while Jamal Murray (10) was Denver’s only other player in double-figures. The Spurs on the other hand had four players in double-figures at the break and were led by Rudy Gay (12). The second half was a much different story from Denver’s perspective as they opened the third quarter on an 8-3 run to make it a one-possession game. 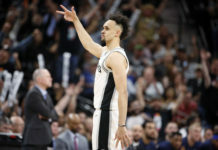 Just when it looked like the Nuggets were going to tie it back up, they missed four consecutive shots and then Colorado native Derrick White threw down the dunk of the postseason thus far. That dunk certainly shifted the momentum back in San Antonio’s favor, but the Nuggets were not going away quietly. In the closing minutes of the third quarter, the Nuggets were able to regain that momentum as they only trailed 72-68 after three quarters. Denver ended up outscoring the Spurs 17-13 in the third quarter as they were certainly trending in the right direction heading into the final 12 minutes of play. 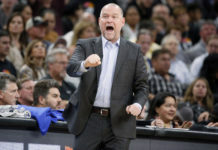 It was a back and fourth game to begin the fourth quarter, but the Nuggets were able to inch a little closer after a Torrey Craig three-pointer with 7:29 left in the game. Craig’s three made it an 83-80 game as both teams were laying everything they had out there. San Antonio maintained their lead though as they were still up 93-87 with 4:45 to play. Denver continued to battle as it was still a 3-point game with just over two minutes to play, until San Antonio made another big basket to make it a two-possession game once again. After a back and fourth minute of play, the Nuggets had it down to a 1-point game with 55 seconds left and possession of the basketball. The Spurs would get a turnover on a Jokic pass before missing two-shots to give Denver the ball back with 13 seconds remaining and a chance to win the game. Murray missed a jumper for Denver, which gave San Antonio two free-throws and the ball with six seconds to play. After two made free-throws by Aldridge, the Nuggets had a chance to tie the game, but it was all for not as San Antonio walked out of Denver with a 101-96 victory. Stat leaders for Denver were Jokic, who recorded his first career playoff triple-double of 10 points, 14 rebounds, and 14 assists. Gary Harris also had a great game as he finished with 20 points on 7-of-12 shooting from the field to go along with three rebounds. Other Nuggets who finished in double-figures were Beasley (10), Paul Millsap (12), Will Barton (15), and Murray (17). The Nuggets and Spurs will now have two days off before game two on Tuesday night at the Pepsi Center. That game is set to tip-off at 7:00 p.m. MDT.